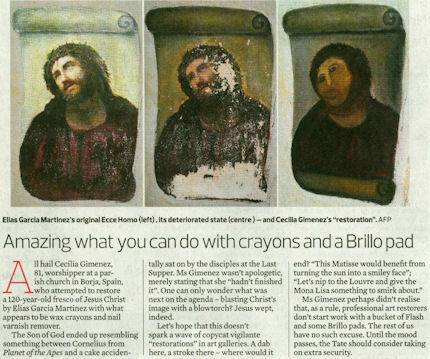 When news broke of the 81 years old painter Cecilia Gimenez’s disastrous restoration of a painting of Christ in her local church, the world fell about laughing (see Figs. 2 to 5). The distressed restorer has taken to her bed as people queue to see the now infamous monkey-faced Christ and, wishing to preserve the hilarity, over 5,000 wags have signed a petition to block attempts to “return the painting to its pre-restoration glory” – as if such an outcome might credibly be in prospect. With one honourable exception (Fig. 1) commentators failed to grasp that while this debacle is an extreme case it is not an aberration within modern art restoration practices. To the contrary, adulterations of major works of art are commonplace, seemingly systemic products of a booming, insufficiently monitored international art conservation nexus. In our previous post it was shown both how a steamboat painted by Turner sank without trace during two top-flight restorations at the US Sterling and Francine Clark Art Institute, and, how Renoir’s oeuvre is being traduced across museums. Here, to show that it is not just in sleepy Spanish churches that paintings are risk, we reprise a few of the professional art world’s own most radically controversial – and officially sanctioned – restorations. A quick rinse with Flash might have been kinder. There are three component parts in the professional restoration armoury: taking material off; putting material on; and, defending and promoting the said removals and additions with techno/aesthetic reassurances. Notwithstanding all supposedly science-validated self-justifications (reports on restorations are invariably written by the restorers themselves), the proper and appropriate test of a restoration is aesthetic appraisal of the resulting changes. It is reassuring that so many recognise that the transformation made to the Spanish painting shown at Fig. 5 constitutes a gross artistic injury. Perhaps the less extreme but also gratuitous injuries recently inflicted by restorers at the Louvre on the Veronese figure and face shown at Figs. 6 to 10 (and here reported on December 28th 2010) might also be acknowledged as the very crime against art and history that they constitute. As shown at Fig. 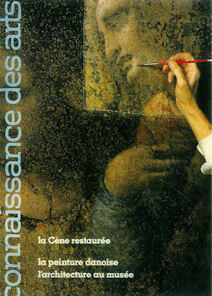 10, even when the Louvre’s restorers were caught having secretly re-repainted the already repainted and publicly criticised Veronese face, the museum maintained a brazen official insouciance. The authorities do these things because they can and, presumably, because they do not know better. They ignore criticisms because they can and again, presumably, because they do not comprehend their force and their gravity. In Figs. 11 to 26 we show the variously unfortunate consequences of restorers taking off and putting on material. (Like Tolstoy’s unhappy families, every unhappy restoration is so in its own way.) It is widely recognised in the art trade that pictures untouched or rarely touched by restorers enjoy better conditions than many-times restored works. For that reason, a high premium is placed on such rare but fortunate works. This reality notwithstanding, nothing seems capable of restraining the tide of restorations. In Figs. 11 and 13 we see two successive restorers at work on the same figure in the same mural, Leonardo’s “Last Supper”, in Milan. 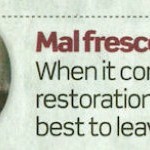 It is a long-standing complaint that restorers thrive by undoing and redoing each others’ handiwork. In Fig. 11 the restorer Mauro Pelliccioli is removing paint with a knife. 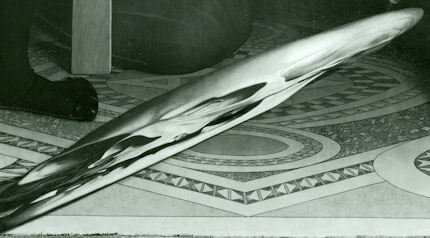 His restoration, the first post war intervention on the notoriously unstable mural, was highly acclaimed at the time. His philosophy had been to remove earlier restorers’ repaint where it concealed original paint-work by Leonardo, but to leave it in place when covering only bare wall (- see our post of February 8th 2012). In Figure 13 Pelliccioli’s former student and assistant, Pinin Brambilla Barcilon, is seen repainting Leonardo’s mural (- or, as restorers prefer, “reintegrating” the remains of original paint with fresh additional paint). 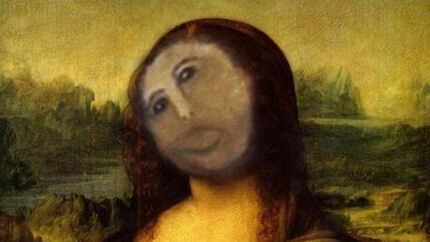 Given that an estimated 80 per cent of Leonardo’s work had been lost and that Barcilon had aimed to remove all previous restorers’ handiwork regardless of whether or not original Leonardo paint survived underneath, she had to do massive amounts of repainting during her agonising two decades long restoration (see our post of March 14th 2012). To French and Italian transgressions many British and American ones might be added. At the National Gallery, London, it has been officially acknowledged that changes are made to pictures “primarily for aesthetic reasons”, and that while these aesthetic changes rest on the judgements of individual restorers whose “different aesthetic decisions” may result in pictures which “look very different”, all such results are considered “equally valid” (see “The New Relativisms and the Death of ‘Authenticity'”). In Figs. 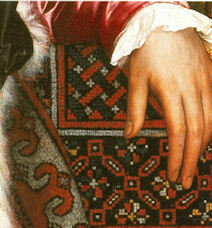 15 and 16 we show a detail of the National Gallery’s Holbein, “The Ambassadors”. During its restoration (which, like that of Michelangelo’s Sistine Capel Ceiling, was a televised and sponsored event) the then head of conservation, Martin Wyld, took the opportunity to improve and, on “experts” advice, to change the surviving design of the Turkish carpet. In doing so, he paid scant regard to the aerial perspective that had previously been found in the picture. Ignoring the shadows that had previously been cast on the carpet, Wyld introduced a crisper, cleaner, flatter, more “on the picture surface”, altogether more abstract, modernist and, therefore, ahistorical version of Holbein’s original depiction. In Figs. 19 and 20 we see the liberties taken by Wyld’s predecessor, Arthur Lucas, on Titian’s “Bacchus and Ariadne”. Lucas boasted to art students at the Slade School of Art that “there is more of me than Titian in that sky”. In thrall to new technologies and materials, Lucas took the trustees’ permission to reline the canvas, as authority for ironing the picture on to a double board of compressed paper. Such boards are today found to be unstable and will doubtless serve to licence further “urgent” conservation treatments. In Figs. 21 and 22 we again show the startling changes made to a painting at the National Gallery of Art in Washington during the course of two restorations. During the first, as seen on the right of Fig. 21, a general weakening of values occurred. The woman’s necklace, for example, was dimished. As seen on the left in Fig. 22 , during a further restoration, part of the necklace disappeared. Rather than paint it back in, the restorer painted out the surviving section, as can be seen on the right. When specific bits of paintings disappear restorers often claim that they were only additions made by earlier restorers. 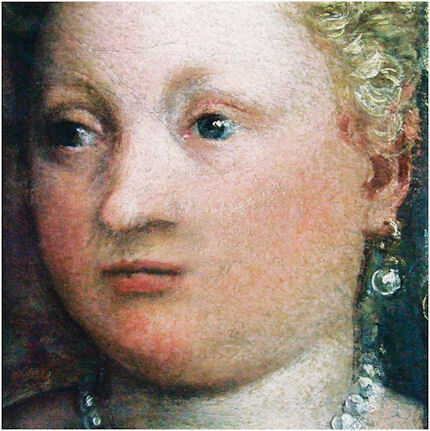 If such claims sometimes provoke scepticism, in the case of overall losses and degradations restorers usually offer no defences, seemingly hoping that curators, trustees, art critics, scholars and members of the public will be delighted or distracted by brightened colours and lightened tonalities. In Fig. 23, on Michelangelo’s Sistine Chapel ceiling, we see both the general lightening and brightening that attends an aggressive cleaning and losses of specific features and pictorially strategic values. Michelangelo had finished off his frescoes with additional glue or size-based painting but because the Vatican’s restorers held this to be either dirt or earlier restorations, it was all removed. Michelangelo had redrawn and remodelled the drapery seen on the left hanging from the figure’s right shoulder. It was washed off. The removal is shown to be an error by the testimony of earlier copies of the ceiling. (Rubens had copied the drapery as it was found before the recent cleaning.) Michelangelo sought to enhance sculptural effects to his painted figures by adding shadows that were seemingly cast by the three dimensional bodies he had depicted with contrasting brightly lit forms and dark, shadowy recesses and nooks. The latter, too, were lost. Back at the National Gallery in London, we see in Fig. 24 similarly catastrophic general losses (in the course of another single restoration) of tonal gradations and modelling. In the case of the horse’s right nostril, we see the loss of the very aperture which formerly had carried air to the creature’s lungs. Alasdair Palmer points out that a comparison of the National Gallery picture with its sister panel in the Uffizi Gallery in Florence is shocking to behold. It is the more unforgivable because the National Gallery restoration was prompted by an earlier one of the Florence picture that had not flattened and weakened the horses. The National Gallery’s great Velazquez, “The Rokeby Venus”, suffered dreadful injuries in 1914 at the hands of a suffragette (Fig. 25). That damage was as nothing when compared with subsequent injuries inflicted by restorers who here too (Fig. 26) were blind to artists’ manipulation of space; creation of atmosphere; rendering of form through calibrated tonal gradations. Before the gallery’s restorers had done their Cecilia Gimenez-esque worst, there existed a parity of brilliance in the two figures, with both displaying the seeming self-illumination of divinities. What sense of that miraculous evocation survives today? Little wonder that the previous owner of the picture made a scene at the National Gallery on sight of its “restoration” and protested that, had he known how it would be treated, he would never have sold it. His grievous personal loss-through-restoration was of a single picture. What price the world’s continuing collective losses at the hands of restorers? Above, Fig. 1: The notice of and the introduction to Alasdair Palmer’s August 26th 2012 Sunday Telegraph discussion (“Restoration Tragedies”) of a botched restoration in a church in Borja, Spain. Above, Fig. 2: Barbara Ellen’s August 26th riff in The Observer on Cecilia Gimenez’s attempted restoration of Ellas Garcia Martinez’s painting of Christ. Above, Fig. 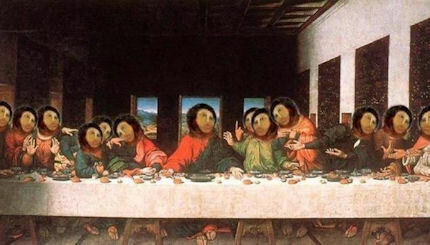 4: The Daily News (“Botched restoration of 19th century Spanish fresco becomes overnight tourist sensation”) carried this spoof on Leonardo’s recently restored “Last Supper” in Milan. For the real consequences of that restoration, see Figs. 11 to 14 below. Above, Fig. 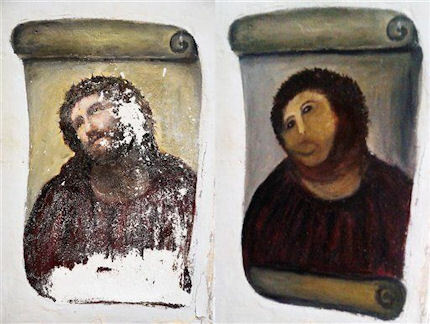 5: Ellas Garcia Martinez’s painting of Christ before (left) Cecilia Gimenez’s attempted restoration (right) of the deteriorating work. Above (left), Fig. 6: A detail of the Louvre’s c. 1560 Veronese “The Pilgrims of Emmaüs”, showing the Mother and Child before the picture’s recent restoration. Above (right), Fig. 7: Veronese’s Mother and Child after the recent Louvre restoration. Above, Fig. 8: Veronese’s Mother before restoration at the Louvre. Above, Fig. 9: Veronese’s Mother after restoration at the Louvre. Above, Fig. 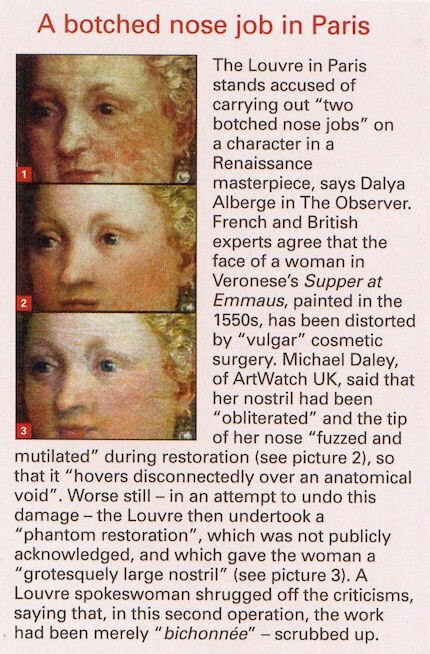 10: The Week’s summary of Dalya Alberge’s June 13th 2010 Observer article “Louvre masterpiece by Veronese ‘mutilated’ by botched nose jobs”. Above (left), Fig. 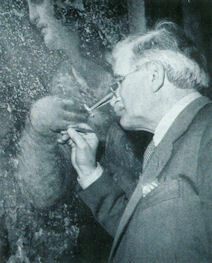 11: The restorer Mauro Pelliccioli scraping paint off Leonardo’s “Last Supper” in Milan during 1953. Above (right), Fig. 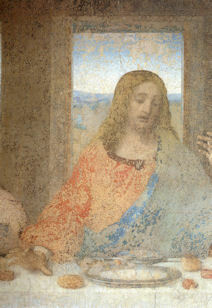 12: The Figure of Christ in Leonardo’s Last Supper” after restoration by Mauro Pelliccioli. Above (left), Fig. 13: The restorer Pinin Brambilla Barcilon retouching part of Leonardo’s “Last Supper” during the early stages of her $8m Olivetti-sponsored 1977-1999 restoration. Above (right), Fig. 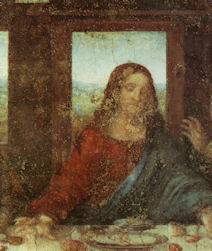 14: The figure of Christ in Leonardo’s Last Supper” after its restoration by Barcilon. Above (left), Fig. 15: A detail of the National Gallery’s Holbein, “The Ambassadors” before its BBC-televised, Esso-sponsored restoration of 1993-96. Above (right), Fig. 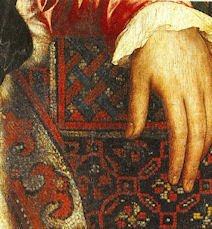 16: A detail of the National Gallery’s restored Holbein showing the extensive repainting of the Turkish carpet. Above (top), Fig. 17: The anamorphic skull in Holbein’s “The Ambassadors”, before cleaning and repainting. Above (bottom) Fig. 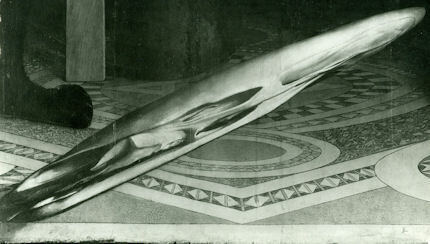 18: The anamorphic skull in Holbein’s “The Ambassadors”, after cleaning and the repainting during which the jaw bone was lengthened and carried over the border at the bottom of the picture. Above (top), Fig. 19: A detail of the National Gallery’s Titian “Bacchus and Ariadne” before its restoration began in 1967. Above (bottom) Fig. 20: A detail of the National Gallery’s Titian “Bacchus and Ariadne” after restoration. Above (top), Fig. 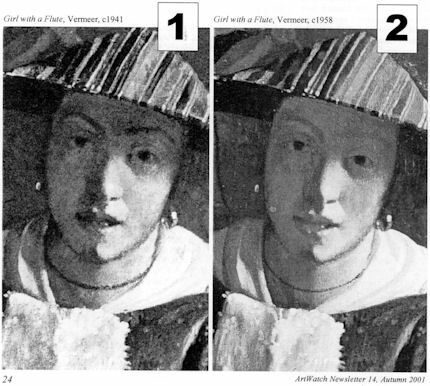 21: Left, the then privately owned Vermeer “Girl with a Flute” before 1941; right, the picture as seen in 1958 after its acquisition by the National Gallery of Art Washington and subsequent restoration. Above (bottom), Fig. 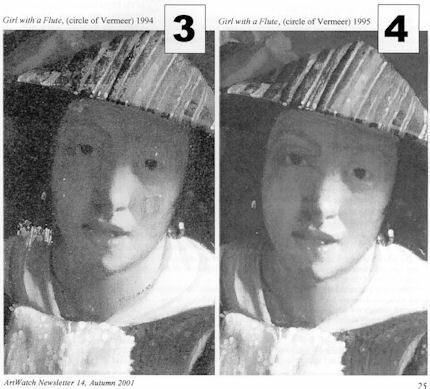 22: left, Vermeer’s “Girl with a Flute” in 1994 during restoration at the National Gallery of Art Washington; right, the (now circle of Vermeer) “Girl with a Flute” after the restoration in which the necklace finally disappeared without comment or explanation. Above, Fig. 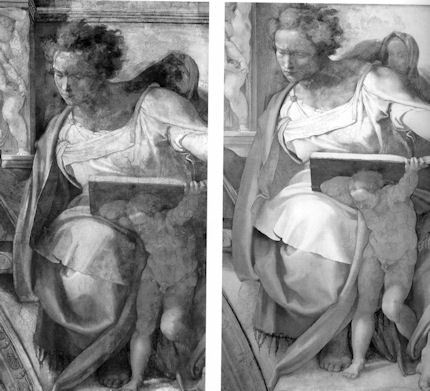 23: Left, Michelangelo’s Sistine Chapel Ceiling depiction of the prophet Daniel, before cleaning; right, the Daniel after the cleaning during which the drapery was changed and much sculpturally enhancing shading was lost, in both cases against clear historical testimony. Above, Fig. 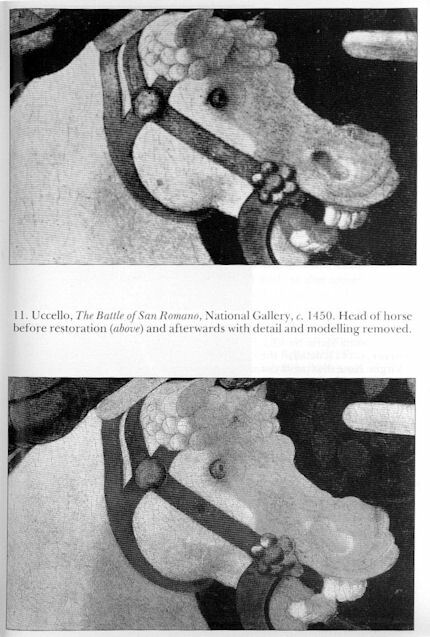 24: Top, a detail of the National Gallery’s Uccello “The Rout of San Romano” before cleaning; below, the same detail after cleaning and restoration. Above (top), Fig. 25: The National Gallery’s Velazquez, “The Rokeby Venus”, immediately after its attack by a suffragette in 1914. Above (bottom), Fig. 26: The National Gallery’s restored Velazquez, “The Rokeby Venus” today.